All themed tours can be included in a tailor-made tour or enjoyed on their own as a private group tour. London is an incredibly popular film location. In this 2.5 hour walking tour we will explore the places where some of the most iconic British films and TV series were filmed including; James Bond, Harry Potter, Sherlock Holmes, Doctor Who, Mary Poppins and Rom-Coms starring the likes of Hugh Grant and Rene Zellweger. We will learn about the locations themselves and then see how directors were able to use the locations to create historical, modern and fictional film and TV locations. We will enjoy back stage gossip, discuss why particular locations were chosen and recreate iconic film scenes ourselves! Cost £10 per person (concessions £9). Minimum group size 15, maximum group size 25. Please bring a travelcard or Oyster card as we will be taking 1 or 2 bus journeys in the middle of the tour. The City of London is changing as never before. 1950s and 60s buildings are being torn down and 21st century buildings rise in their place. New skyscrapers with ever stranger nicknames join the skyline and new buildings in ever stranger shapes fill the irregular plots of building land. More varied building materials are used, from beautiful bronze to pearlised glass to coloured mirrored glass. Ancient Roman and medieval passageways are being opened up across previously closed sites and even ancient waterways are remembered. This tour starts with post-World War 2 rebuilding and visions for a new London, before exploring buildings designed by the great names of 20th and 21st century architecture such as Richard Rogers, Norman Foster, Terry Farrell and James Stirling, and ends with a vision of the future exploring the “Eastern Cluster” (around the Cheesegrater and the Gherkin) where new buildings are in the process of being built and planned. For those who think they know London, or think they know the City, this tour is for you! The tour begins at Barbican tube station and ends in the centre of the City (a short walk from Bank tube station) and lasts approx 2 hours. Cost £10 per person (concessions £9). Minimum group size 15, maximum group size 25. Take a meander through the City of London as Christopher Wren might have known it. Explore the medieval alleyways and street layout that contributed to the spread of the Great Plague in 1665 and the Great Fire of London in 1666. Learn how the fire began, spread and who was blamed and see how it was remembered. The later 17th century was also a crucial period in the development of London as a financial centre so we will explore the coffee houses where great financial institutions were born. Post-fire Christopher Wren was the dominant personality in London’s rebuilding, shaping how the City was rebuilt. He also oversaw the building of 51 City churches as well as his masterpiece St Paul’s Cathedral. We will admire some of the best examples of work, and learn more about him as a man, what inspired him and how his architectural style developed. We will finish by reflecting on the role of the Blitz, the 2nd Great Fire of London, in shaping his legacy and the City of London as we know it today. London’s royal parks provide a green haven for Londoners and visitors alike. We will also discover how the parks evolved over the centuries. The parks as we know them today were shaped by kings and queens of the past; including a king who suffered from asthma and so fled dirty, smoky Westminster for the clean air of Kensington, a queen whose happy loving marriage inspired a beautiful water feature and a king whose affairs were responsible for a complete absence of plants elsewhere in the parks. This walk starts at Hyde Park Corner and includes Green Park, Hyde Park and Kensington Gardens and takes approx 2 hours. Cost £10 per person (concessions £9). Minimum group size 15, maximum group size 25. London is all about good food and drink! This 2 hour tour is focused in Southwark, historically the centre of London’s brewing and food processing industries, nicknamed “London’s larder”. With beer and inns famously came entertainment, and Southwark was known as London’s “party district” in Shakespeare’s time. We will explore some of these medieval, Shakespearian and industrial links whilst also enjoying some of the most iconic Thames views including the Tate Modern, Globe Theatre and Millennium Bridge. 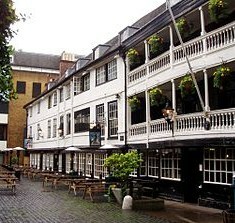 The tour includes a visit to a bustling food market and ends at one of the oldest pubs in London! The tour lasts approximately 2 hours, and the best time is on Thursdays or Fridays. Cost £10 per person (concessions £9). Minimum group size 15, maximum group size 25. Hidden amongst the bricks and concrete of London you can find oases of greenery and explosions of colour, as long as you know where to look! This day tour of London includes historic graveyards, surprising water gardens and perfumed medicinal gardens. Enjoy the incongruity of traditional gardens and Roman ruins next to buildings by award winning modern architects and discover the beautiful gardens unintentionally created by the Blitz of World War 2. Discover the guilds which ran medieval London through the gardens they created and learn all about the medicinal and other practical uses of plants at Chelsea Physic Garden. The tour lasts from 10:00 to 17:00 with breaks for morning coffee and lunch and involves one tube journey across London. Cost £20 per person (concessions available) plus entrance to Chelsea Physic Garden (approx £10). Minimum group size 12, maximum group size 20. Please bring a travelcard or Oyster card for the tube. Are you organising a social outing – a corporate event, stag / hen do or school reunion? I can provide bespoke treasure hunts suitable for the age and interests of your group, either within a small area that can be covered on foot or using public transport across London. For example, what about a “Noah’s ark” themed treasure hunt across Westminster and the City! How many animals do you think you could find? I can give you clues to help you track down an elephant, camel, grasshopper, a cat eating oysters and even a glow worm!